Industry Newbie! – How do you know if this business is for you? As you make the decision to change the direction of your life, there are many variables to consider. Starting or expanding your own business is a big step. It can be exciting and exhilarating. It can also be scary. …………………………………………..
We’ve all heard the adage, “Love what you do and you’ll never work a day in your life.” Well, we’re living proof of that! The first question you need to ask yourself is, “Are you a dog person?” Not, “Do I like dogs?” Not, “Do I own a dog?” You need to ask yourself, “Do I really love dogs?” and “Do I have a true passion for them?” If the answer is “yes,” then we’re off to a good start. If you’re a dog person that loves dogs, dog training, behavior consulting, dog walking and pet sitting can be a fantastic business. We’re able to wake up and spend our day doing something that we have a true passion for – dogs. There are plenty of other jobs that will allow you to capitalize on the booming pet industry, and if you’re purely interested in the economics, we suggest you check them out. At the DogSmith, we’re looking for people that have a good business mind and want to be successful business people, but who also want to combine that money-making endeavor with a true passion for working closely with dogs and other dog people, day in and day out. Remember, though, you need to enjoy helping people too. Pets come with guardians. Guardians are the ones who schedule the appointments, pay the invoices and are our vehicle for helping pets. People skills are critical – they are one half of the customer service equation! As you’ve read above, we’re looking for license owners that are motivated by more than money. A happy DogSmith license owner appreciates the flexibility and freedom that a true home-based business-like dog training and pet care can provide. Don’t get us wrong, as a DogSmith licensee you will work hard. But we truly believe that a successful business life depends on a successful personal life. And we believe that our home-based business model gives license owners a real chance to achieve exactly that. 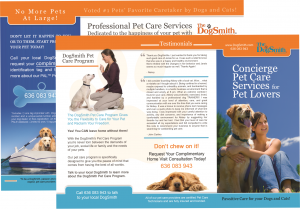 In 200 7, The DogSmith was formed as a single unit dog training and pet care business in North West Florida in the United States. Within a couple of years, we realized that we had developed multiple resources that could easily be transferred to, and used by, other professionals in need of marketing, business and client service systems to help them operate and grow their own businesses. The best way for us to do this was to create a licensing program that provided legal permission for approved businesses to operate under and use The DogSmith name. Through this licensing program, DogSmiths get access to all The DogSmith trademarks, programs, support services and resources. In addition, the original program of study for DogSmiths is now available through our sister company, DogNostics Career Center. 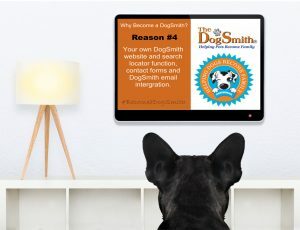 As a DogSmith licensee you have access to the DogNostics programs at a discounted rate. 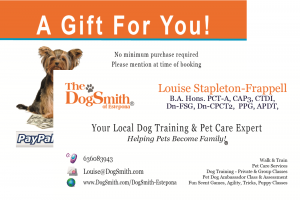 Some of the DogSmith license options include the DogNostics Dog Behavior Diploma Program or the Training Mesiter Certificate. Watch a short video about how The DogSmith can help you and then click here to review some of our DogSmith partner pages. You will see immediately how many benefits there are to be joining the DogSmith. If you would like to ask us any questions once you have seen the video, you can simply complete the DogSmith application form and we will contact you to schedule an informal chat. At The DogSmith, we have a great streamlined system that helps take you through the process. You can find further details about this process here with all the necessary links.